Preserve your Family Heritage… Publish your own Family History Books! Remember – Unlike photo albums, we can make as many copies of your book as you like. This way all family members can have their own copy! Here is your chance to showcase your family heritage for years to come! All too often family stories and experiences are not handed down to future generations. Classic family photos, documents, newspaper clippings etc. are often tucked away in old shoe boxes. Even if these items eventually reach the hands of family members, the stories, names and places are often lost forever! At Smith Printing Company we will help you turn your collection of family photos, stories and experiences, documents and family lineage into a hardbound book commemorating your family. How do I get started? The first thing to do is gather all of the information you will need: pictures, documents, letters, newspaper clippings, etc. Put all of these items in chronological order. As you look through your collection of family information, write down any stories or thoughts that come to mind. Talk to other family members about their remembrances. Write down the names, dates, places and significance of the items and people in your photographs. You can make your book one long story or a collection of shorter remembrances. The personal insights and experiences you share will introduce future generations to the people, places and things that meant so much to you! What if I am not very good at writing? No problem. We can give you assistance if you need it. You don’t have to be a professional writer to share about your experiences. Some books are all words and others mostly pictures. You can create it however you like. The most important part is that it comes from you! Is there a difference between a genealogy book and a family history book? When we publish a genealogy book for someone, it typically contains very detailed documentation and records. A genealogy book can be a way of historical record keeping. 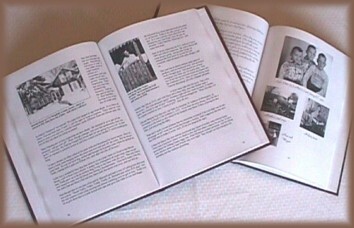 A family history book is usually a less formal gathering of stories and pictures. The narrative is often first person and more subjective than a book purely containing genealogical information. Each has its purpose and is important in the recording of family information. Pictures can really enhance your Family History Books! Click here for information on adding pictures! Due to the uniqueness of each project, we like to personally discuss your needs on an individual basis before we give you a quoted price. We believe that we will be able to provide you with a quality service at a very reasonable price. If you already have your family history project ready to publish, you can click the link below to get an estimate.